How can I tell if my Mac is keeping the clock updated properly? I would like to know what the default settings for OS X are in terms of keeping the clock adjusted when I enable automatic time sync in the Date & Time preference. I do know that the venerable ntpd daemon on Mavericks (10.9) and Yosemite (10.10) is no longer responsible for adjusting the time and instead a new program pacemaker has been introduced — so how can I know things are working or need adjustment to keep time? Mojave still uses timed, but ntpdate has been removed. To check and update your system time, you can call sntp directly. High Sierra uses timed, from /usr/libexec/timed, run by the system user _timed. timed maintains system clock accuracy by synchronizing the clock with reference clocks via technologies like NTP. Inputs are merged inside of timed, where it calculates uncertainty to facilitate scheduling proactive time jobs. timed is also aware of power/battery conditions. 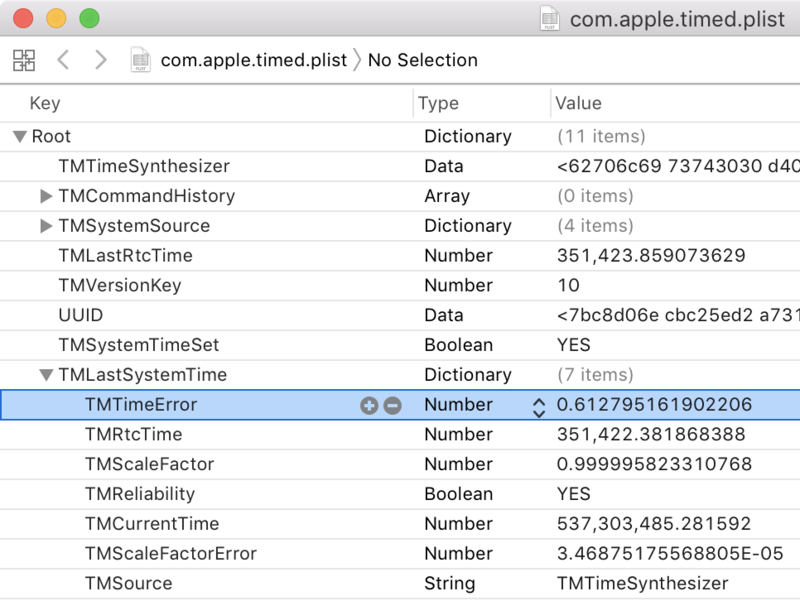 You can see how 'off' your clock is by looking at the contents of /var/db/timed/com.apple.timed.plist, under the TMLastSystemTime dictionary in the TMTimeError key and the TMScaleFactorError key. timed takes no arguments, and users should not launch it manually. timed appears to be a simple sntp client - i.e. it polls the NTP periodically (15 minutes) and uses the settimeofday() system call to set the sytem clock. I assume it has some cleverness to avoid stepping the clock backwards but there is no way to tell. pacemaker is the daemon responsible for managing the time in macOS. It uses adjtime to adjust the clock per the content of /var/db/ntp.drift. This means that the clock is -23.64 PPM away from the time that it should be. The units of this number is PPM, or Parts Per Million. 1 PPM is 1 microsecond/second, or 3.6ms/h. To see the parameters being used by OS X for pacemaker, open /System/Library/LaunchDaemons/com.apple.pacemaker.plist. The first step is to see if your time is set up. Assuming you have delay/offset/jitter values less than 100 (delay could be less than 1000 in normal situations for less time-accurate-critical systems), the next command to run in terminal is ntpq followed by the timeserver from your ntpq and system preference. You can also test other time servers to see if they have lower delays since the timekeeping system likes to have a close, fast response from time servers when correcting the time for millisecond differences and calculating how the current hardware clock is drifting away from the standard time. This shows that on battery, the adjust interval is no more than once every 10 seconds and adjusting even less if the clock error is less than 0.1 millisecond. If you find that your offset is seconds or more, you might want to change the timeservers you use or perhaps change the values used on pacemaker to use more energy and CPU but have a clock closer to the true time in exchange for the settings Apple has shipped with 10.9. How can I keep my system clock in sync under Mavericks? If you go to http://time.gov you can see the official time (up to the second) and use that to verify if your system time is correct or not. Note that this is the official NIST time, and does its own synchronization in the browser, independently of the system time (as an example, you can see here that time.gov handles leap seconds, whereas OS X apparently does not). Starting with High Sierra the ntpd system daemon was replaced with the timed system daemon which invokes /usr/libexec/timed. The resulting output is by far less verbose (= boring). E.g no ∂T/drift details. 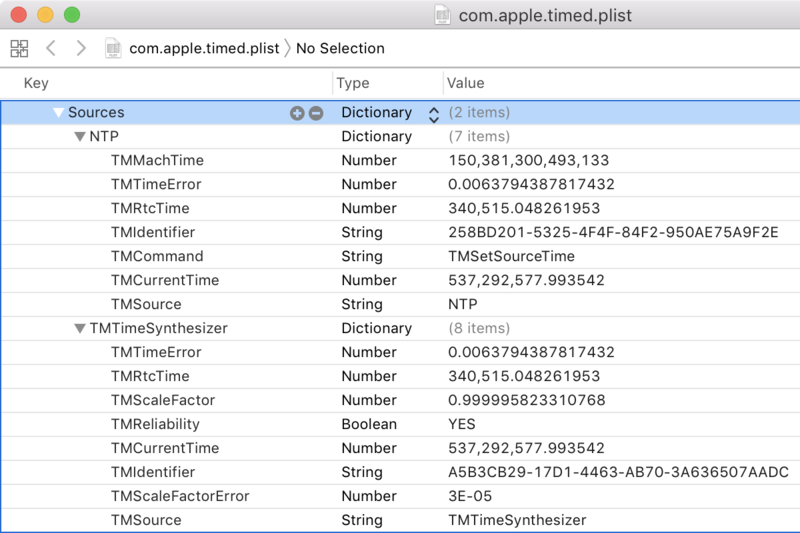 Apparently timed uses only one ntp-server (the first one listed - checked with WireShark/LittleSnitch) even if several are entered in the system preferences/ntp.conf file. in SIP disabled mode. Entering ntpq -p will work again then. If I find a better exec to get time details with the default High Sierra daemon the answer will be updated. In this case, this meant to say my local clock was off some 810 µs (which would be spectacular, if actually true, but the value well below 100 ms does indicate a working synchronization). To check clock sync, similar to the answer which suggests to run ntpdate in debug mode, you can also run it in Query mode for less verbose output. This is from my Mac running High Sierra 10.13.2, which runs timed rather than the NTP daemon (ntpdate still works because it doesn't use the NTP daemon). Not the answer you're looking for? Browse other questions tagged macos mavericks ntp time-tracking . The `ntpdate` command was removed from Mojave. What to use now? How do I use UTC with NTP? Why is my (automatic) clock running 8 minutes behind? What are the command(s) to script a daily time sync? How do I get rid of the clock in the menu-bar in Mac OSX? How to tell when time has been sync'ed with NTP server in Mac OS X Lion? Can I remove one partition on an external drive, while keeping the other intact? How can I simply and reliably track my computer usage?